I’m currently working on the Steam trading cards, badges, emoticons, and all that stuff. 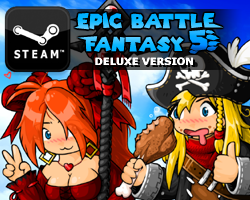 This entry was posted in Epic Battle Fantasy 4, Game News on January 22, 2014 by Matt Roszak. They decided to implement Steam API for you! I want all of the slimes! 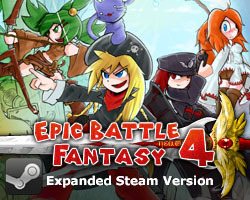 I can’t wait to see EBF 4 on steam in the meantime I’m going to play it on Kongregate. I WANT THIS…..when I get a better pc…. Woop! I guess this is setting the standard for any possible future EBF games then. Any idea how many badges this game will have? If i remember how simple but still complex and hard the EPF series did started… it is now an really great development that it starts to get his own marketplace whit so many fans all over the world. I need to say that the series started to catch me really when it became an RPG what happened whit EBF 3. From this moment i always played the game over an over again. It never gets boring or the same… you always play in a different way. And this is what an real RPG should make it special the own touch and feeling. Matt really knows how the old RPGs where and what their feeling did make out. In combination whit the humor and the eastereggs he brings into his games he meets a point of real story combined whit exploring the surroundings to find every secret he has put into the game. I hope that in the future maybe also EBF 3 will come to Steam or maybe an “Collectors Edition” whit all 4 games from the EBF Series. 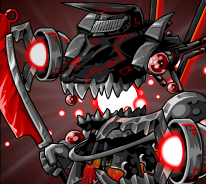 But for the future of this Serie i hope that it will get more sequels after the current EBF 4 project is done. You have my money for sure already. If it would give an preorder option for this game at Steam it would give many players (me included) who will preorder this game directl. Continue this awsome work Matt and never loose it. i totally agree. y dont matt ask steam whether they can allow him to do a preorder thing on steam? It barely made it through Greenlight, who is going to preorder indie games anyway? And I think this would make Matt feel compelled about releasing the expansion as soon as possible. I’m fairly certain Matt enjoys a slower tempo. umm what does sta means? Sta means that we shouldn’t decide for Matt what he needs or needs not do. That’s simply preposterous.